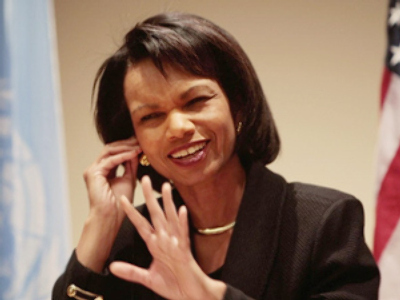 ROSSIYSKAYA GAZETA writes that Condoleezza Rice’s smile together with her verbally expressed gratitude to Russia for co-authoring the latest UN Security Council resolution on the Middle East was received as an unprecedented diplomatic miracle after months of tough rhetoric addressed to Moscow which had caused analysts to start talking of a new Cold War. The paper says the resolution became an example of how strong the song becomes if the singing is done together by Russia and the U.S. There could have been many more songs like this one, concludes the paper, if Washington had paid heed to Moscow’s opinion that international politics is not about emotions but common sense and calculation. VREMYA NOVOSTEI says about the same event that the only cause for surprise about the last-in-the-year UN Security Council resolution on the Middle East, which in other senses was a usual UN document dismissed by its critics as ‘toothless,’ was the fact that it was jointly authored by the U.S. and Russia, and that Condoleezza Rice behaved in an unusual way. The paper says, after her words of gratitude towards Russia ‘we even started feeling slightly sorry that the current Secretary of State is leaving her office in January.’ The document itself, says the paper, is, in fact, quite useful for the peace process in the Middle East: it confirms the unanimous opinion of the four international mediators and is a good stepping stone for further work in this format; it also supports the idea of arranging the next meeting of the two sides of the conflict together with the mediators in 2009 in Moscow. Nino Burdjanadze is one of them, says the paper, and she has shown a lot of political shrewdness in the past few years, first learning from Shevardnadze then turning her back on her teacher, then staunchly defending Saakashvili in 2007 only to leave politics for a while and return as his strongest critic after his aggression against South Ossetia. Today, however, says the paper, in spite of Burdjanadze’s tough rhetoric addressed to the current president, the response from the government media is not tough in any way. Maybe, says the paper, Saakashvili who is ‘running around and beating his wings like a beheaded chicken trying to prove that he is still alive,’ in fact is preparing himself and his supporters for a smooth transfer of power to Burdjanadze who has all the markings of the next president of Georgia pre-selected by Washington, awaiting orders to make the final move. KOMSOMOLSKAYA PRAVDA writes that the next Russia-U.S. chess game in the Caucasus is going to be played out in Azerbaijan. The paper says that Baku, bathing, like Moscow, in oil income, isn’t as heavily involved with the world’s stock markets, so its perspectives for the financial crisis are somewhat brighter. However the country has found itself inside a knot of political and economic interests of three major powers: its neighbours Russia and Iran, and the United States.